Born on a parallel earth he is the counterpart to Superman having all the same powers and abilities. He is a black version of Superman sporting an Afro in a world very similar to that of the late 60’s and early 70’s. He was a member of the Love Syndicate [Animal Man # ]. During the first crisis his world was destroyed. The Psycho-pirate would later revive him. During Infinite Crisis he was one of an army of Supermen used by Alexander Luthor Jr. During final crisis he was a member of the Supermen of the Multiverse [Finale Crisis #]. Born on the alternate Earth classified as Earth 47 in the new multiverse this world is known as home to the psychedelic champions the LOVE SYNDICATE of DREAMWORLD. 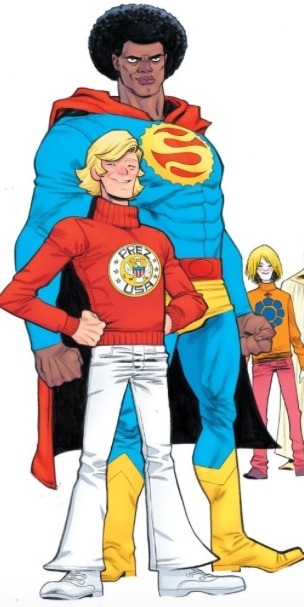 Sunshine Superman is the leader of the LOVE SYNDICATE which includes The Shooting Star, Speed Freak, Magic Lantern and Brother Power, the Geek. The team is financed by the immortal teen-aged President Prez Rickard (Multiversity Guidebook 2015).